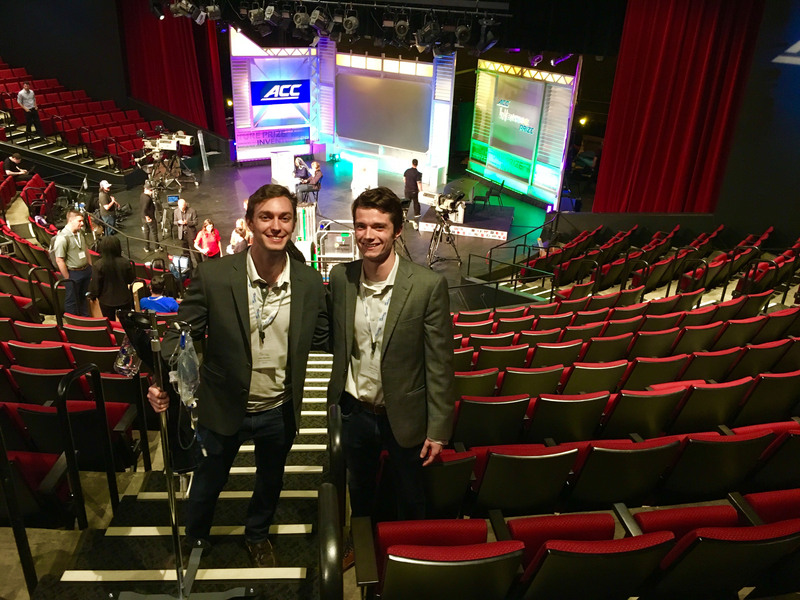 Alec Gillinder ’20 and Quinn King ’20 on the set of the ACC InVenture Prize Competition. Syracuse University students Alec Gillinder ’20 and Quinn King ’20 (College of Visual and Performing Arts, School of Design) have made it to the final five of the ACC InVenture Prize Competition. The elite finalists, selected from a field of ACC university semifinalists by a panel of industry experts and investors, will face off “Shark Tank”-style in a live PBS show televised from North Carolina State University today (Wednesday, April 17) at 8 p.m. The one-hour show, dubbed “The Battle of the Brains” between ACC universities, will be streamed live, starting at 8 p.m.
Syracuse University students, faculty, staff and friends can help the home team by watching the live stream and voting for MedUX in the People’s Choice Award. Use the Text-In Number (770.637.3005) and use keyword MEDUX to vote by text or vote online. Voting will open around 8:40 p.m., after the last team has presented, and will remain open for only five minutes. One vote per device. For those missing the live action, Central New York PBS affiliate WCNY will broadcast a recording of the finals on Sunday afternoon (April 21) across the New York state public broadcasting network. The ACC InVenture Prize is a talent search for top student innovators at the 15 colleges and universities that are part of the Atlantic Coast Conference (ACC) Academic Consortium. The competition plays off the spirit of the ACC, with an emphasis on big ideas. While ACC teams regularly battle it out on athletic playing fields, the InVenture Prize offers the chance for students to meet on the innovation playing field. This is the second time a Syracuse University team made it to the final five. Kate Beckman ’17, G’18 (Newhouse), founder of FreshU, made it to the final five in 2017. The Blackstone LaunchPad powered by Techstars at Syracuse University Libraries coordinates the campus qualifier and also mentors and coaches the teams that compete for the coveted title of top inventor. MedUX developed its concept for a portable intravenous wearable at Invent@SU last summer and worked this past year with the LaunchPad on a commercialization strategy. The team has built a prototype; raised seed funding; won $47,000 in campus competitions; assembled an advisory team of industry; medical and product development experts; filed two provisional patents; and developed strategic relationships with U.S. Food and Drug Administration (FDA) consultants and commercialization partners who are ready to help take the product to market. Gillinder and King are currently filing their non-provisional patent and seeking mission-driven investors to help take them through the FDA Class I process, usability testing and production. Syracuse University’s participation is supported by the Office of the Provost to help students go toe-to-toe with their ACC peers for prize money to launch their next venture. In addition to Syracuse, the 15 participating ACC institutions are: Boston College, Clemson University, Duke University, Florida State University, Georgia Tech, North Carolina State University of Notre Dame, University of Louisville, University of Miami, University of North Carolina-Chapel Hill, University of Pittsburgh, University of Virginia, Virginia Polytechnic Institute & State University and Wake Forest University.